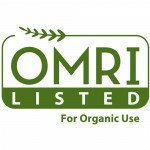 Plantskydd Soluble Powder Concentrate has been listed by the Organic Materials Review Institute (OMRI) for use in production of organic food and fiber. (c.f. Federal Register, 61(45), Mar. 6, 1996) and therefore is not subject to federal regulation. DO NOT ingest powder/solution — wash hands after use. 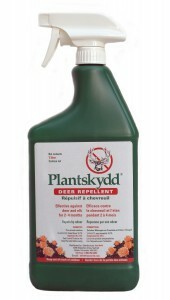 DO NOT apply directly onto edible parts of fruit, vegetables and other food crops. If solution comes into contact with eyes or skin, wash/flush with water. Avoid spraying concrete or wood to prevent discoloration. Rinse sprayer, gloves and planting equipment after use. If sprayer clogs, rinse in hot water. 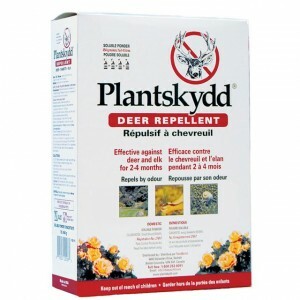 Seal unused powder and store in a cool, dry, dark place for up to 2 years. Use pre-mixed RTU solution within 90 days after opening. DISPOSAL:Rinse empty container thoroughly — Recycle or dispose with household garbage. IMPORTANT NOTICE – This product is sold without warranty, including warranty of merchantability and fitness of use of the material, and upon condition that the purchasers shall make their own tests to determine the suitability of the product for their particular purpose. We assume no responsibility for results obtained by the application of this information or the safety and suitability of the product either alone or in combination with products of other manufacturers. The user assumes all risks of use or handling, whether or not in accordance with any statements of the supplier and the supplier’s liability, if any, for any action arising of the material being supplied shall be limited to replacement of material.